In high school, I often heard my peers ask our teachers the same question over and over again: when am I ever going to use this again? With this question, students are essentially asking—how does this matter outside of the classroom? Why are we doing this? What are the benefits? Whether your student teaching experience is perfectly ideal or horribly negative, there are lots of benefits of student teaching. Think about how the following top benefits could apply to your experience. Classroom management doesn’t come easily to everyone. It takes a lot of practice to figure out how to handle a classroom full of students. What will you do when someone is talking out of turn? What should you do when students are bothering each other or fighting? It takes practice to figure out what works. During student teaching, you get the chance to practice what you’ve learned from your professors and readings. You can figure out what works for you. What types of lessons do students enjoy? What teaching strategies are the most effective? Student teaching provides a safe environment for you to experiment with different lessons and teaching strategies. That way, you can figure out what you should use when it comes time to get your own classroom. Another one of the benefits of student teaching is that you get to observe different teaching styles. Even if you don’t agree with your cooperating teacher, chances are that he or she has a particular teaching style. As you observe their style, figure out what things you like and don’t like about it. During student teaching, you get to figure out what kind of teacher you really want to be. During student teaching, you need to learn how to work with different individuals. Surely, you spend a lot of time with your cooperating teacher. But you also get to know your university supervisor, administrators, other teachers, and staff members of the school. Chances are that you’re not going to get along with everyone. That’s okay. It’s great practice for the time when you’ll actually be a teacher. Then, you will need to learn how to get along with other teachers, administrators, district personnel, parents, students, staff members, and more. Use your time now to figure out how to work with them whether you agree with them or not. 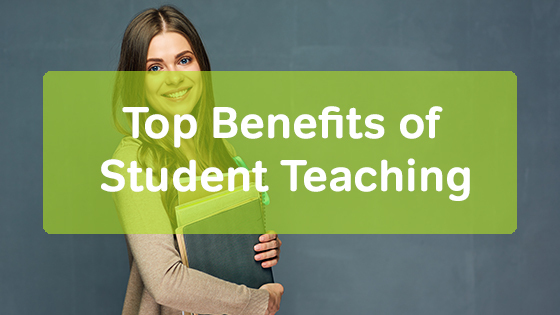 Although it’s not without its flaws, there are many benefits of student teaching. As you prepare for student teaching, focus on everything that you can get from the process. Take full advantage of the opportunity, so you’re better prepared to have your own classroom someday.